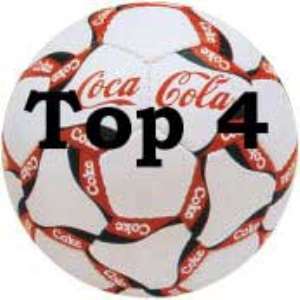 Kumasi, Jan 22, GNA - Ben Wilson's penalty kick in the 64th minute enabled King Faisal to draw 1-1 with Accra Hearts of Oak in the opening match of the 2005 GHALCA/Coca-Cola Top Four Soccer Tournament at the Kumasi Sports stadium on Saturday. The penalty came about when a defender of Hearts pulled down Faisal's speedster, Eric Gawu in their goal area and Takoradi-based referee, Cecil Fleischer whistled for a spot kick which was converted by Wilson to enable his side draw with the Confederation Cup Champions. Both sides exhibited robust and spirited football with Faisal missing chances in most part of the game. It was Hearts Prince Tagoe who struck first in the fourth minute in an effort to find the opener but Faisal quickly returned the attack with Sumaila Alhassan and Gawu missing clear chances in the sixth and the seventh minutes respectively to put their side ahead. Hearts stalwart defender and captain, Amankwah Mireku who moved deep into Faisal's area in the 11th minute wasted a chance while Mohammed Hassan receiving a yellow card in the 13th minute for rough play. Gawu beat two Hearts defenders on the run to shoot at goal but goalkeeper James Nanor came out boldly to save the situation. Hearts from then on attacked from all angles and it came as no wonder when Prince Tagoe scored the opener in the 43rd minute from a Lawrence Adjei's cross. Faisal came into the game strongly after the recess and nearly got the equaliser in the 47th minute but Sumaila Alhassan's shot sailed over the bar. Sensing danger, Hearts brought in Joe Ansah for Hassan in the 48th minute to strengthen their defence as Faisal continued to pile pressure with Abduali again missing a chance in the 52nd minute. Faisal also brought on Micky Ofosu for Owusu Agyemang in the 60th minute and with both teams reducing the tempo of the game before Gawu who pounced on a loose ball and was attempting to score was brought down in the vital area for Wilson to score from the resultant spot kick in the 64th minute. Hearts substituted Prince Tagoe for Michael Kyei in the 74th minute but it was still the home team, Faisal who remained in control of affairs. Disaster strike Faisal when their dependable defender, Nana Kwasi Bobie-Ansah was shown the red card for dissent. Faisal who seemed not deterred by the misfortune continued to pile on the pressure on Hearts while their defenders kept the attacking machinery of Hearts at bay until the final whistle. At end of the game, Eric Gawu of Faisal was adjudged the best player of the game and he was presented with a ghetto blaster and Coca-Cola products.